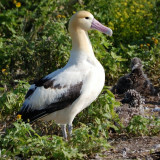 In Midway Atoll there are 2 (documented) short tailed albatross. An adult that lives on Eastern Island and a juvenile that lives on Sand Island. I discovered the juvenile near frigate point whilst riding around the runway. After taking pictures, I went and showed them to Midways FWS biologist John Klavitter. That afternoon we captured the juvenile and took it to Eastern Island, so it could meet to adult.... hoping that they may form a pair bond and breed. Two days later the juvenile was seen back on Sand Island. The world population of Short-tailed Albatross is currently estimated at 2000 birds. There only other known breeding colony is the volcanic Japanese administered island called Torishima.